Our bracelets for Craft Hope's project 12 are finally in the mail only a few days before the June 15th deadline! The twins decided to help me today with just a few more before sending them off. 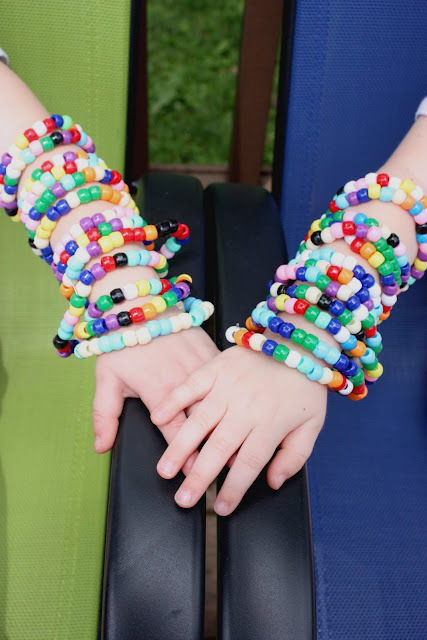 We made a total of 25 with sizes that fit my wrist to even the littlest wrist of Evangeline. Unfortunately I missed the deadline to participate in the Project 13: security blankets for tornado survivors. I do hope to join in on the next project as soon as it is posted! Gotta go. Have some reading to catch up on. Well, so glad to have you back! And again, my thoughts are with your son. Hope he is better soon!